Happy almost weekend, friends! Because you took the time to stop by here and because I love you for that, I have something special to share. A couple of weeks ago my sweet friend Thara found this adorable necklace that looks strikingly similar to the little house in my blog header (Thanks Thara! Now start a food blog already!). Before I knew what hit me, I had snagged one for me... and one for one of you! And some new shoes, but that's another story. 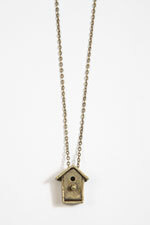 The winner of this giveaway will receive a brand new Urban Outfitters Birdhouse Necklace in bronze. To enter: Leave a comment on this post by noon Pacific Time on Thursday, April 29th. You can say anything, tell me who you are, where you're from, what you like to cook, how you found Playing House, share your favorite recipe, or just say hi! I'll choose the winner Thursday afternoon using a random number generator. Yes please :). Then I'll get to think of you whenever I see it :). You inspire me with my running, chica. I don't think I've ever told you. How cute is that?? My whole family (except me) is obsessed with birdwatching. I've been the holdout, resisting. But on my last visit I secretly put out yarn scraps for nest building and secretly wand a Sibley. Resistance is futile! Hi, Amy. Thanks for the chance to enter. I'd love to give this to my mother - for Mother's Day! i heart that cute necklace...and your food making abilities...and the book "The Stinky Cheese Man"
Woohoo!! I love your give-aways!!!! Haha. I hope I win!! Your blog is awesome!!!!! That is so cute! I love it! I love the website, and this necklace is so adorable! I would LOVE to win the cute little birdhouse to give to my mother for Mom's Day. I grew up in Eugene so your tales of the PacNW make me miss home. So cute! I am Playing House's biggest fan! I give your web address out to everybody I know! Love it, and your fabulous blog! Oh so darling! I'm so glad your blog is around, my google notebook is overflowing with recipes to try because of you! Hi! I'm Joy Wang from the sunny San Jose, California. Right in the heart of the silicon valley :D I absolutely love reading all your recipes and bloggings. I always look forward to your new posts! Oh, how cute is that?! I'm also in Washington state...but I live on the dry side! Love the Champagne Cake! Wish I'd known about it before I had my two girls. It would be perfect for a baby shower! I'd love to win this for my mom, since she loves birds. Thank you for the giveaway! Adorable- love this little charm so much!! We are planning (trying to plan) a long weekend on the west coast- hopefully this summer/fall. So excited. Super cute, reminds me of my Grandpa. He made the most beautiful birdhouses. What a great thing to give one to your fans too! Love your blog, so much yummy stuff! I love it! I am a big fan of birdhouses....now if only I can find a flummel to represent my blog! cute necklace! i can't wait to try the champagne cake. I stumbled upon your blog, and I've been hooked ever since. I too am a grad student and aspiring foodie. Happy Blogging! Too cute! love the champagne cake recipe, will have to try it soon! I stumbled across your blog from suggestions Google Reader gave me -- I subscribed after seeing the delicious food! I love birds, cake & Amy! I'm also a few steps closer to thinking about baking something. ;)oxox! This necklace matches your blog so perfectly! I'm Michelle and I love to cook. Most of my "favorited" cooking blogs I found looking for how to cook something (although I don't remember exactly what I was looking for when I found yours.) You have a great blog, thanks for sharing your adventures. I just stumbled on your blog and from one fellow social worker and grad student to another-thanks for sharing your thoughts and recipes! Its great to take time away from work and school to share your thoughts/fun with others! Of course you got some shoes too, send a pic!I love your blog, I love that sweet necklace (where did Thara find it?) and I love you! I love it, and I would love it! hello! ha thanks for the reminder to enter! i am just dying to try making your chicken tikka masala. and this necklace is too cute. thanks for the opportunity to win!